Malcolm yelled “Good luck!” to the bald eagle. Before work on Sunday, the first and only really lovely spring day this year, Malcolm and Clio and I went for a “run.” It was more of a fast walk, because he’d just eaten pancakes, but that suited me exactly. We came to the place where a bald eagle had built a nest across the canal. 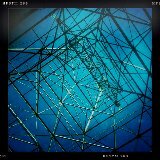 A big, random-looking pile of sticks on the top of a huge metal tower. The tower last year, before the nest was built. What are these things called? I hadn’t actually seen an eagle there, but I stopped to look every time we passed. This time I saw a big hulking bird farther down the tower, and I asked Malcolm if it had a white head, because I couldn’t see that far, and it could have been a vulture. It did! It did have a white head! We walked back on the other side of the canal, to get a closer look. Malcolm was talking cheerfully about his schemes for the future, and I was thinking how good it felt to go for a walk with him again, and hear his zany chatter, after a long, shut-in winter. When we got to the tower, the eagle was gone, but we stood for a moment looking up into the bright blue sky. You could feel the earth getting warmer all around us, waking up and coming to life. And then the eagle flew up out of the river, and landed very low on the tower, where we could see it perfectly. It was a stunning moment, it’s not an exaggeration to say that it felt as if my heart soared up with the eagle. We watched it for a while, sitting there so beautiful and impossibly large and completely cool, and then Malcolm yelled, “Good luck,” and we walked home. It felt so sunny, to hear him say that, to think about Malcolm encouraging this huge unruffled raptor. It seems so precarious to try to raise chicks on the top of a tower that holds power lines, in a world full of people, it feels like such a hopeful thing to do. I’ve been feeling vaguely anxious lately about equally vague events that may-or-may not happen. Worried about the future more than usual, troubled by time passing though I know there’s not a damn thing I can do about it. It feels good to take a walk, and see the eagles and the geese sitting on their nests in the sunshine, everybody is doing what they have to do, getting on with their lives, waking with the spring. Isaac recently showed me the sign for “All you need.” You hold your hands together in front of you, and then spread them to your sides. It’s a beautiful gesture, particularly as performed by a serious eight-year-old. It seems like a good gesture to make when you’re feeling anxious, to remind yourself of what you have, and that all you can do is what you have to do, and try feel good about what you’re working on and where you’re going. It’s a gesture like spreading wings in the sunshine. Isaac likes crostini. I made these last week after he’d been sick for a few days and eaten nothing but toast. These were like a step up from toast, and Isaac ate quite a few. 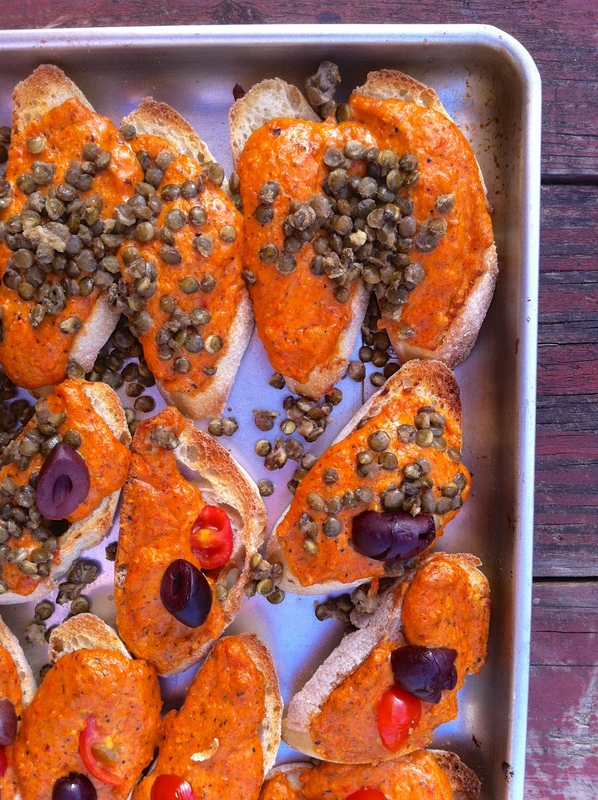 The sauce itself is inspired by romesco sauce, and it’s sweet smoky nuttiness goes well with the sharp saltiness of capers and olives. It made a nice meal with a big salad. Here’s All I Need by Radiohead. Lightly toast the bread slices. In a food processor combine the hazelnuts, peppers, cheese, olive oil, balsamic and herbs. Process until fairly smooth. Add enough water to make it completely smooth. Put a generous spoonful or red pepper-hazelnut mixture on each slice of toast. Top with capers, olives and tomatoes. Return to the toaster oven or put under the broiler of a regular oven until the top is lightly browned and everything is hot through. Serve! This entry was posted in appetizer, bread, recipe and tagged bruschetta, capers, crostini, hors d'oevre, olives, romesco, toasts by Claire. Bookmark the permalink.